This book is for young people who are concerned about war. What the roots of war are! How we create "The Enemy"! A new way to handle violence! How each of us is responsible for preventing peace! 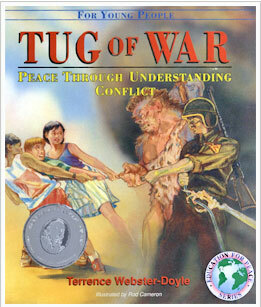 This Book Encourages the Study of Conflict Resolution as an Integral Part of a Young Person's Education! One night I was walking around my neighborhood after midnight. I live in a small town where it's safe to walk at night. 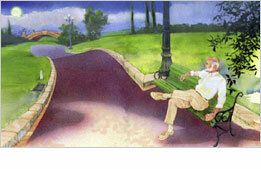 The streets were quiet and the air sweet with the scents of spring. The moon shone brightly and there was a deep silence. I enjoy walking when everyone is asleep. There is more opportunity for understanding when the brain is quiet. While walking, I was aware of how peaceful it was. There was no conflict, no violence. It was as if everyone had gone on holiday. It suddenly dawned on me that war ends when people go to sleep! I was awakened early the next morning by the violent sound of cars—metal boxes driven by people fighting each other in traffic lanes on their way to spending eight or ten more hours fighting each other in competitive lives. The holiday was over. That's when I realized that conflict is an everyday event. Sometimes schools are a battlefield: students fight amongst themselves or with school authorities. Sometimes the workplace is a battlefield: employees fight with employers or each other. We fight to be first in line or to get a parking place. Sometimes we fight to get compensated or recognized for our work. Life sometimes seems like one big fight. The main problem with fighting is that it causes separation. It tears people apart instead of bringing them together. If we're ever going to get people to come together, we're going to have to cease fighting. And the only way we can do this is to learn to understand why we fight in the first place. A conflict between you and a friend, and a conflict between Russia and the United States are not much different. If you can understand what has caused conflict between you and your friend, then you can understand why the U.S. and Russia might disagree. This book is about understanding conflict. I like this book because it is fun to read. I learned survival means no fighting. I learned about the structure of conflict. It taught me what the roots of war is and how we handle violence. Tug of War helped me to better understand myself and that each of us is responsible for preventing peace! You can not look in one direction, seeing things in one way. The more open-minded you are, the more you will see and better understand yourself as well as other people. I truly enjoyed reading this book.